this old crumbly sketchbook from 1911.
i acquired it on ebay some months back. i wasn’t sure about plunking down the dough for this one as it was substantial, but i put in a low-ball offer and was surprised when it got accepted. a travel sketchbook from a long ago mediterranean sea voyage. i marvel at the people captured on the deck. enjoying the views, the sea air, a bit of warm sun. can’t you just imagine these women posing there against the railing? i wonder how long they stood there. in 2000 i drove up this very hill, lykavittos , the path of the wolves, with my greek friend, dimitris. up up up through the forested slopes we climbed until we finally came to the clearing at the very top with a panoramic view of athens spread out below. there was a small church on top and i bought a small sequined tchotchke that i still have all these years later. no wolves on top of the hill but lots of dogs. love these images of athens so so much. what an amazing trip this must’ve been for the artist. each scene so beautifully rendered. oh i know this place! recognized it immediately before i even saw the name scrawled below. in 1911 the ottoman empire was still in existence. it would be a dozen more years until the creation of the republic of turkey and the change of the name to istanbul. if i listen close i can hear the call to prayer ringing out across the city. if there is a more haunting beautiful sound i have not heard it. i dream of floating down the turquoise coast someday. stopping for swims in the luminous water. …to the east coast of sicily and the ancient city of syracuse founded by the ancient greeks. look closely. can you see the tiny people sketched in below? i don’t know what happened to the person who painted these pictures. but i am ever so glad they made their way across the seas and the miles and the long years all the way to my doorstep. i will place them among the other strays i’ve collected. hope you’re enjoying october in your part of the world. baking pies, chopping wood, canning the last of the summer harvest, putting your gardens to bed for the winter, picking apples, making cider, reading, napping, walking, collecting leaves and acorns. all that. i’ll just be here with the cat posse. doing this & that. Wow! So much fun to travel though this long gone artist’s eyes. I’m so glad you shared. The image on the deck is so evocative! And the one of the woman who looks to be weaving is lovely. Do you think that’s what she’s doing? Thank you thank you for sharing. Ha! I dare you -no, double dare you, to go down the Google path. First I tried the street name and google maps took me to a lovely complex with a beautiful church across the street. Then a few tries at variations on the name and wedding records and I’ve concluded the “Northley” has a long and distinguished lineage dating back to colonial days. It may be E. Winslow Northley perhaps. My initial thought it was woman, of some affluency, who was the artist. Given the time period it would have required money to travel great distances and the initial sketch of a man, well, in my opinion, captured adoration. Wow. That is incredibly gorgeous even on my tiny ancient iPhone! I know, I know, LAST post I said was the best but I lied this one is. Oh Mary Ann that is simply an amazing score there young lady! Are you planning to keep as is or do something marvelous with the sketches? Did you learn anything about the artist? Omigosh, Mary Ann, what a treasure this is! then all of a sudden the call to prayer! Really magical. It has a very special place in my memory. Thank you Mary Ann. happy-happy! joy-joy! Once again reading your blog has given me a great start to another Saturday! As i sit here sipping my morning brew while soaking in the pages of my favorite blogs, plans of sketching, painting and tending to my succulent garden swirl in my head. Seeing your beautiful sketchbook acquisition has fueled my inspiration even more. I simply love the drape of the fabric in the figures and how the light and shadows were so deftly captured. Ah, to be so skilled! It’s a beautiful day down here along the coast of San Clemente. The sun is shining in clear bright skies – this is when the ocean displays its deepest blue hues. The beach is beckoning seekers of shells and glass to come find their treasures. Such a fantastic find, doubly so that you’ve been to some of those exact spots 100 years later, making your own sketches. each image worthy of a frame. what a remarkable find! the coast of croatia sounds dreamy. how lovely it must’ve been! What a beautiful collection of memories. I can just imagine the artist watching the people and places around them but to be able to capture the memory so creatively is just wonderful. Thank you so much for sharing with us all. yes, Carol, and to think it was all sketched live, no iphones to snap pics to record the colors and what-not after the initial sketch. amazing. I know it may not matter but I wonder if the artist was a man or a woman? Whichever, the paintings are beautiful and heartfelt – that wish to capture the moment. We all know that. An American friend lent me his mother’s college scrapbook (pre-war) so I could photograph all the little room party invitations and shy little messages between students. Such a privilege, as your sketchbook is. So glad to see it. Thanks, Mary Ann. What a treasure and glad it has landed in the hands of someone who appreciates and cherishes it. 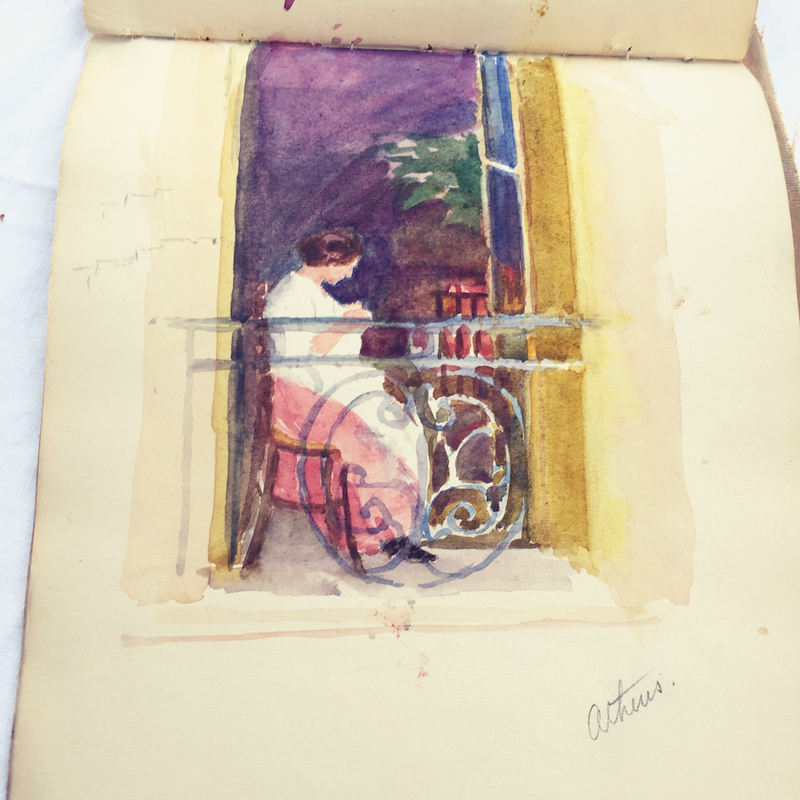 I have my mother’s sketchbook from when she was about 15 years old-around 1927. It has wonderful sketches in it-many of movie stars of that era. We also have several sketchbooks that belonged to my grandfather who was a painter, printmaker and lithographer. family sketchbooks…how nice those must be! Thank you for sharing this marvelous sketchbook. I could almost feel the places the artist visited. My husband made several Mediterranean cruises on an aircraft carrier when he was in the Navy in the 70s. He enjoyed visiting the cities and towns along the way and told me many stories of the people he met and the places he was able to visit. . I would not have liked to be on that ship but would have loved to have followed along. What an absolute TREASURE!! Thanks for sharing it!